With non-toxic plant-based powergreen technology. Sparkling clean with less scrubbing. Certified cruelty free. Certified cradletocradle (silver) - designed + sourced responsibly from beginning to end to beginning again. That's good karma. Hello, we're method. We are people against dirty®. In your hand, you hold the power to join us in the good fight. The fight to make our planet, and homes, a cleaner place. We are passionate believers in the Cradle to Cradle® design philosophy, meaning that each one of our products has a past and a future. That's why we make our bottles from old bottles and our non-toxic cleaners are biodegradable. It's also why every material we use is assessed by independent scientists for environmental quality + safety for people. Because we believe that cleaning products can put the hurt on dirt without doing harm to people, creatures or the planet. They can even smell like rainbows. It might sound like a tall order, but we're a small, passionate bunch with big ambitions. We believe that anywhere you wear a towel should remind you of a spa. Find another use for your elbow grease. The bathroom is where you get sparkling clean, so shouldn't your bath + tiles be the same? We think so. Put an end to icky grime and get a spa-inspired clean by using our non-toxic bathroom cleaner with powergreen® technology. The naturally derived formula easily dissolves soap scum + pesky stains, so you do less scrubbing. Spray. Wipe. Stand back and admire. For use on most sealed surfaces - showers, tile, fixtures, glass, baths. Psst: it's always a good idea to test in an inconspicuous place first. 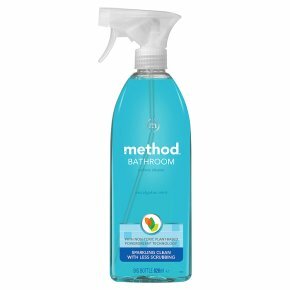 METHOD BATHROOM CLEANER<br>Keep out of reach of children. IF IN EYES: Rinse cautiously with water for several minutes. Remove contact lenses, if present and easy to do. Continue rinsing. If eye irritation persists: Get medical advice/attention. If medical advice is needed, have product container or label at hand.<br><br>WARNING. CAUSES SERIOUS EYE IRRITATION.<br><br>CAUTION.<br>Not suitable for use on marble and natural stones.